Ottawa shouldn’t be running deficits for deficit’s sake or spending for spending’s sake; protecting the federal government’s fiscal capacity must be a priority too, writes Sean Speer. 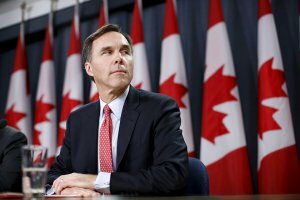 Finance Minister Bill Morneau will soon provide Canadians with a fiscal update on the state of Ottawa’s budget. It comes at a key moment for the government. The next election is less than 12 months away. Debt, deficits and government spending will loom large in the campaign. Morneau’s update should bring focus to this inevitable debate. It’s been nearly three years since the Trudeau government was sworn in and delivered its first and only Speech from the Throne. The government’s budgetary plans were clear at the time. There would be modest deficits in the short-term. Then Morneau was to balance the budget by next year. Readers will know that this plan soon started to shift. The annual deficit doubled relative to his promise. The timeline for returning to a balanced budget was put off indefinitely. And the trend line worsened. Last year’s deficit was essentially unchanged from the year’s before. Ongoing deficit spending is difficult to justify based on fact or theory. The deficit has risen in spite of a growing economy. Large-scale, new spending — a 20% increase in just three years — has mostly gone to a grab bag of government priorities rather than infrastructure or other growth-enhancing areas. And, with an election coming, history tells us that spending growth is likely to even climb higher in the short-term. The government and its defenders have tended to dismiss those who raise concerns about Ottawa’s spending and deficits. Their principal arguments are that the deficit and debt are low relative to the size of the economy and federal public finances are sustainable over the long-term. But if the case for fiscal alarmism is unwarranted, surely so is fiscal complacency. Just because we’re not facing a fiscal crisis is hardly an argument in favour of Ottawa’s unproductive spending binge or running budgetary deficits at the peak of the business cycle. It also ignores the downside risks to Ottawa’s budget if the economy deteriorates. A recent estimate suggests that an economic slowdown similar to the one that Canada experienced in 2000-2001 would cause the deficit to hit nearly $50 billion due to lower revenues and higher spending on employment insurance and other counter-cyclical benefits and programs. A major economic contraction similar to the 2008-2009 global recession would have an even more marked effect. And that’s before any further “stimulus” spending that would invariably follow. Protecting the federal government’s fiscal capacity must be a priority – especially in light of growing concerns about the fiscal sustainability of some provinces. Ottawa shouldn’t be running deficits for deficit’s sake or spending for spending’s sake. This should start with restoring the principle that deficit spending should be extraordinary. Running budgetary deficits shouldn’t be driven merely by political whims or a lack of trade-offs and prioritization. It also therefore requires greater rigour in determining what constitutes the “public good,” when new, incremental spending is justified and how policymakers will measure its efficacy. Public spending should produce benefits that, at minimum, outweigh the cost of each additional dollar collected by the government. Morneau’s upcoming economic and fiscal update should enable a serious debate about how Ottawa spends. We need it. We cannot let fiscal complacency to set in.